Danae Stefanou is a musicologist and performer, currently based in Greece. She studied musicology and piano performance at the Universities of Nottingham (MA, 2000) and London (PhD, 2004), and worked at Royal Holloway, University of London as a Visiting Lecturer and Project Manager on the online Chopin projects (www.cfeo.org.uk and www.ocve.org.uk). In 2007 she was appointed Lecturer at the Department of Music Studies, Aristotle University. As a musicologist, she has published articles in Journal of Interdisciplinary Music Studies, Journal of the Royal Musical Association and Frankfurter Zeitschrift für Musikwissenschaft and has recently completed a critical translation of Michael Nyman’s Experimental Music (in Greek). 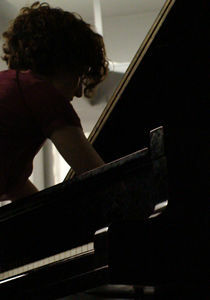 As a pianist and improviser, Dr. Stefanou has given first performances of several verbal, graphic and open-form scores for solo piano and ensemble since 2005; she also improvises regularly with a number of groups and collectives, including the electroacoustic duo Acte Vide (http://acte-vide.blogspot.com), which also leads an improvisation workshop in Athens since 2009, and the large-scale mixed-media ensemble 6daEXIt (http://6daEXIt.wordpress.com). Listen more here. Dr. Stefanou visited Tuscaloosa during the week of April 18, 2011. As a part of her visit, she presented a lecture and a performance. The lecture, “Improvising Greece,” was hosted in Gorgas 205 at 3:30 pm on April 20. In this lecture, she examined current and recent contexts for musical and mixed-media improvisation in Greece, doing so against a backdrop of dominant perspectives on improvisation. Focusing on the country’s two largest cities, Athens and Thessaloniki, she attempted a critical contextualization of Greek improvisation initiatives within a micro- and macro-climate of cultural, political and social change, and assess the significance of such initiatives on a national and international level. Her piano performance, an Evening of Experimental Greek Music and Intercultural Improvisation, also featured the University of Alabama’s own Andrew Raffo Dewar, of New College (soprano saxophone). This performance took place in Moody Recital Hall in the School of Music at 7:30 pm on April 21.